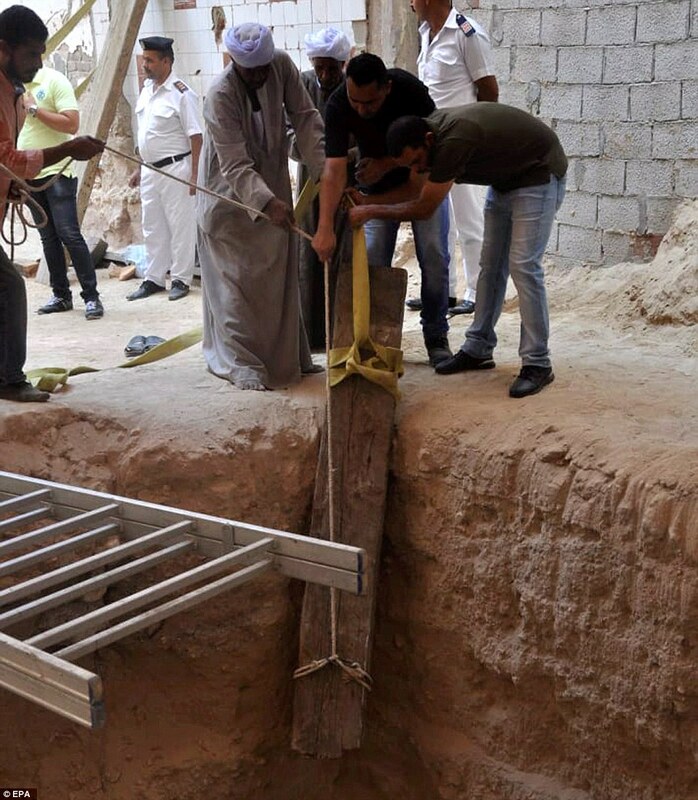 Three skeletons have been found inside a black granite sarcophagus uncovered in the Mediterranean city of Alexandria in July. Nadia Kheider, from Egypt's Antiquities Ministry, revealed the skeletons belong to a woman in her early 20s, a man in his late 30s and a man in his early 40s. The female was relatively short, measuring between 5 foot 3 inches and 5 foot 5 inches (160 to 164 cm) tall and the youngest male was only marginally bigger. The eldest of the skeletons is also by far the largest, measuring an impressive 6 foot tall (181 cm). One of the males had a 6.7 inch (17 cm) hole in the back of his head that was originally thought to be an arrow wound but the researchers now think it as a result of 'surgical intervention' and the person lived for some time after the drastic procedure. This operation - known as trepenation - releases pressure and swelling and was thought to rid the person of any evil spirits lurking inside them. It is believed the bodies were buried on two different occasions, as every skeleton was found on top of one another. 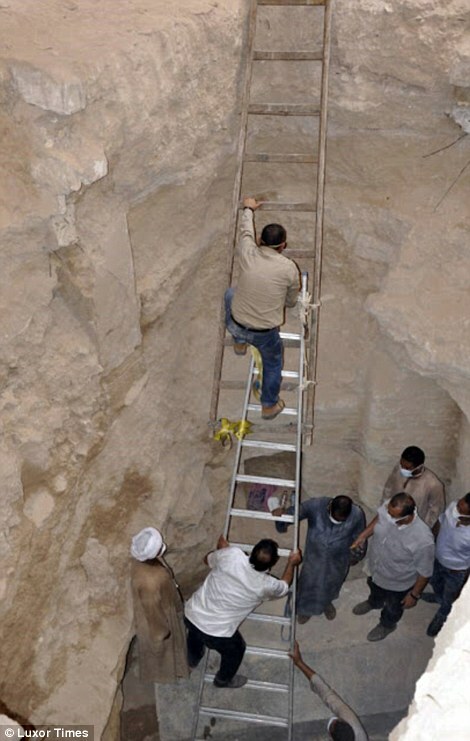 Mostafa Waziri, head of the Supreme Council of Antiquities, said the researchers also discovered small gold plates wrapped in elaborate artwork alongside the remains. The artwork is believed to indicate military rank, and could prove that the individuals were Egyptian soldiers. 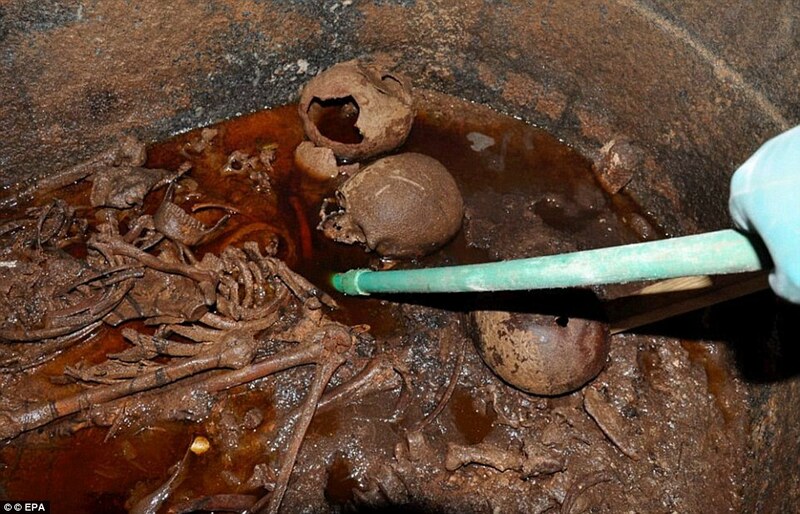 Red fluid and sewage water festered in the 2,000-year-old sarcophagus and caused a social media sensation. 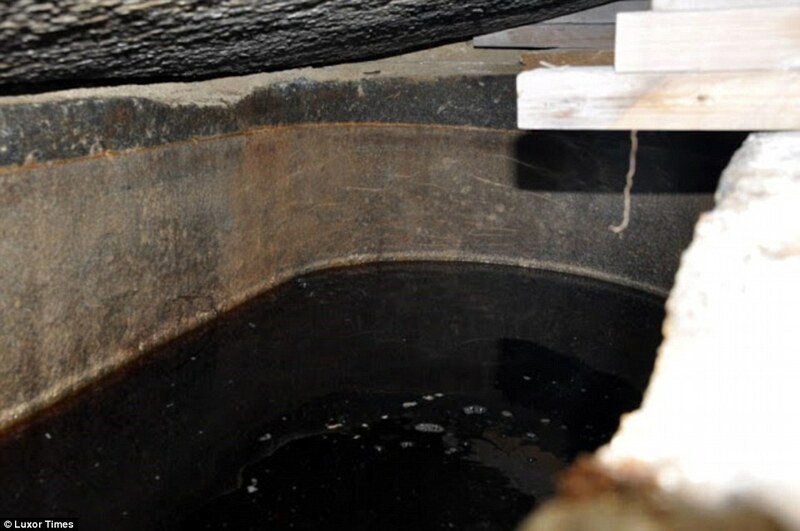 The ministry says the liquids likely accelerated the rate of decomposition and that it is now being studied in greater detail. More studies are now being performed on the bones, including DNA analysis and CT scans, to find out more about them and to determine whether they were members of a single family. The hole in the head of one of the males indicates he underwent trepenation, which involved removing a chunk of the cranium via scraping or drilling. Trepenation was common in many cultures throughout history, but was relatively rare in Ancient Egypt, according to Dr Zeinab Hashish, head of the research team studying the sarcophagus. They added that only a few skulls from ancient Egypt were found to have undergone the procedure. 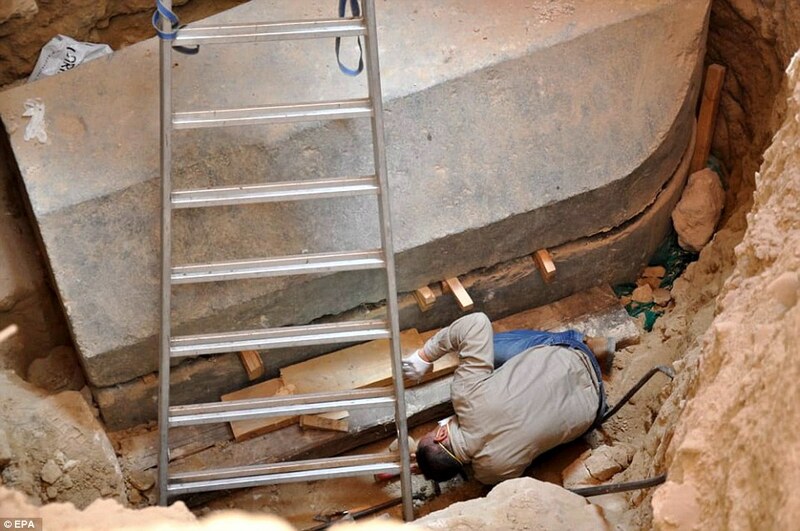 The mysterious ten foot (three-metre) sarcophagus was found on the northern coast of Egypt in the city of Alexandria which was founded by the legendary leader of the same name. 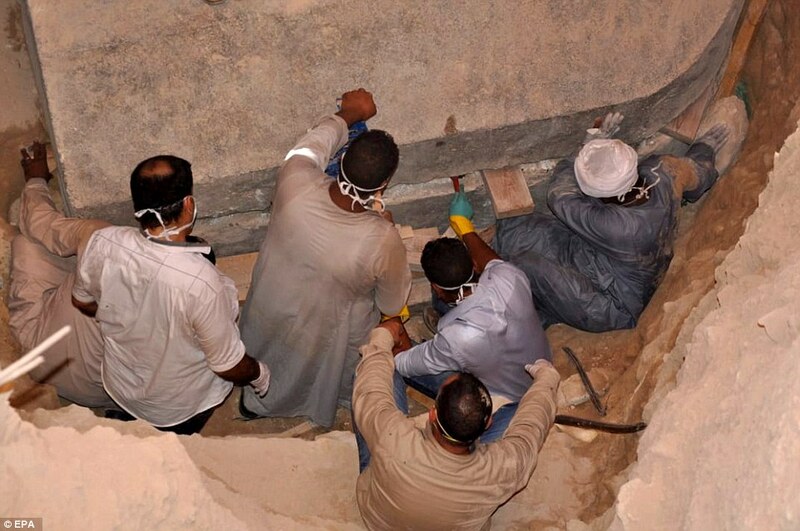 The 6.5ft (two metre) high coffin was first discovered last month in a 30-ton (27,000 kg) tomb that was found buried 16ft (five metres) beneath the ground of the city. The move was confirmed by Mostafa Waziri, secretary general of the Supreme Council of Antiquities of Egypt. 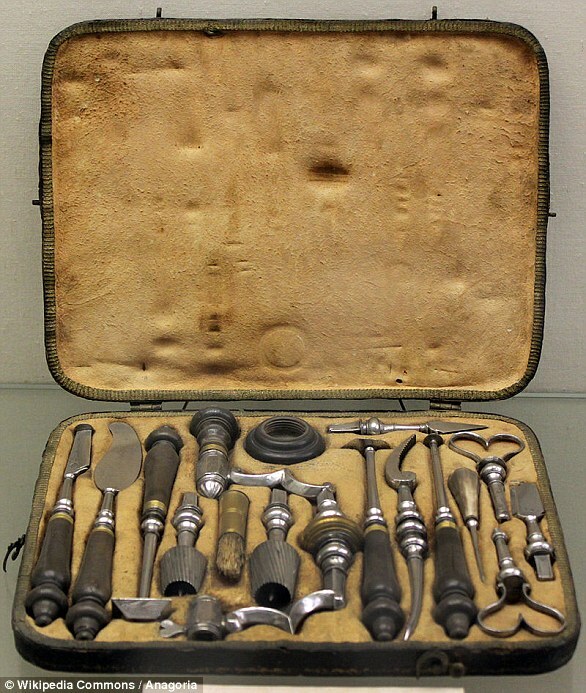 Trepanation is a procedure which was done throughout human history. It involves removing a section of the skull and was often done on animals and humans. The first recorded proof of this was done on a cow in the Stone Age 3,000 years ago. It was a process that was still being conducted in the 18th century. The belief was that for many ailments that involved severe pain in the head of a patient, removing a circular piece of the cranium would release the pressure. Before then, dating back to the Neolithic era, people would drill or scrape a hole into the head of people exhibiting abnormal behaviour. It is thought that this would release the demons held in the skull of the afflicted. 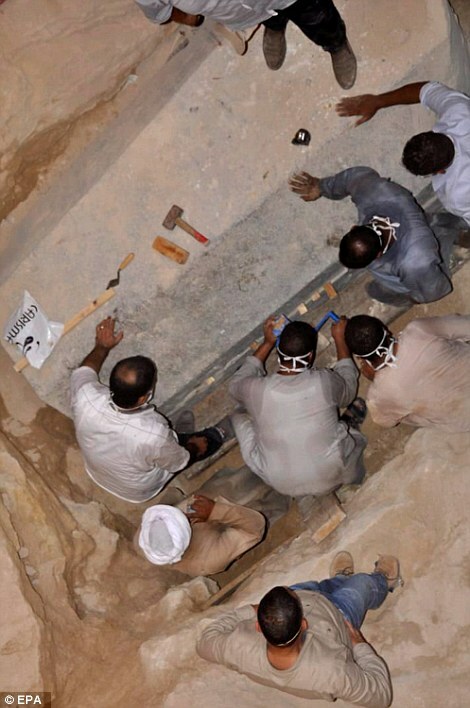 'The sarcophagus has been opened, but we have not been hit by a curse, said Mr Waziri. None of the three mummies belong to a Ptolemaic or Roman royal family, as had previously been suggested, according to reports in Egypt Today. Mr Waziri said in a press statement at the time of discovery that one of the skulls showed signs of multiple fractures. He originally suggested that it had been hit by a sharp instrument and that it belonged to a soldier. 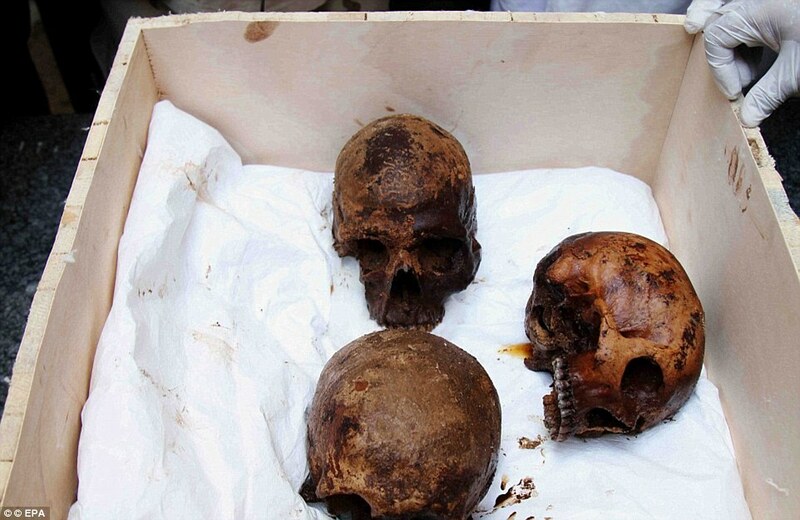 'Preliminary examination suggests the skeletons belong to three army officers, one of them his skull shows an injury of an arrow,' Shaban Abd Monem, a specialist in mummies at the Ministry of Antiquities, told Luxor Times. 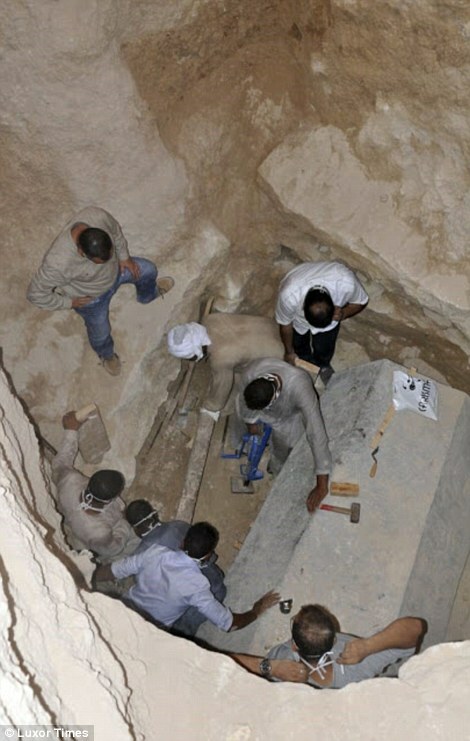 The three mummies were moved to the Alexandria National Museum, while the coffin was transferred to a military museum. The sarcophagus was uncovered inside an ancient tomb as well as a bust made from alabaster whose features had eroded into obscurity. Egyptologists at the time determined the tomb belonged to a nobleman as opposed to a king, The Daily Telegraph reported. Some historians believe Alexander's remains could one day be discovered on top of the modern city, which is built on the ancient settlement he established. 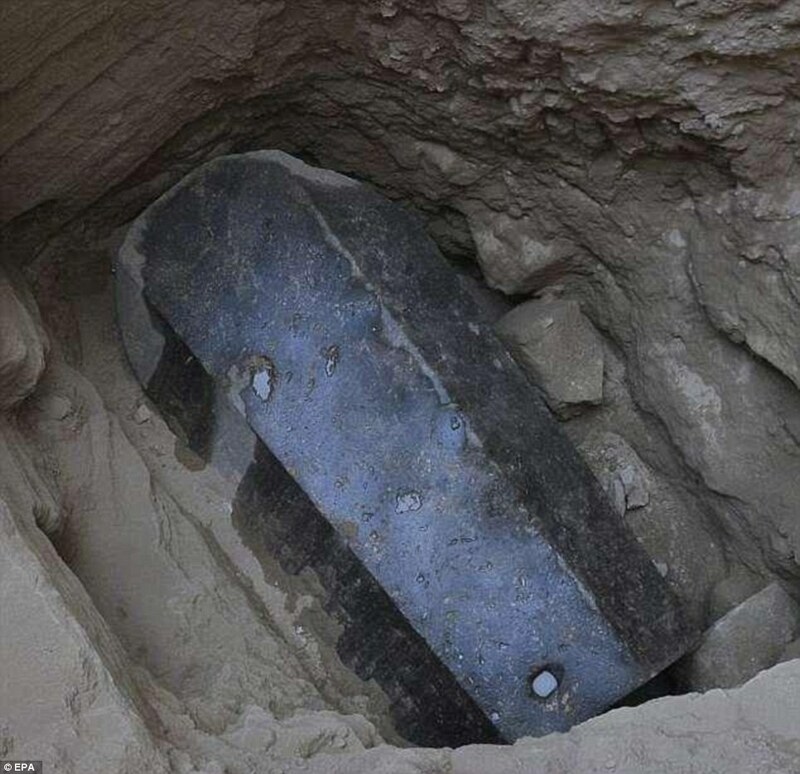 Antiques ministry officials said at the time that the sarcophagus had been sealed for more than 2,000 years. An undisturbed layer of mortar sat between its lid and the body of the coffin. 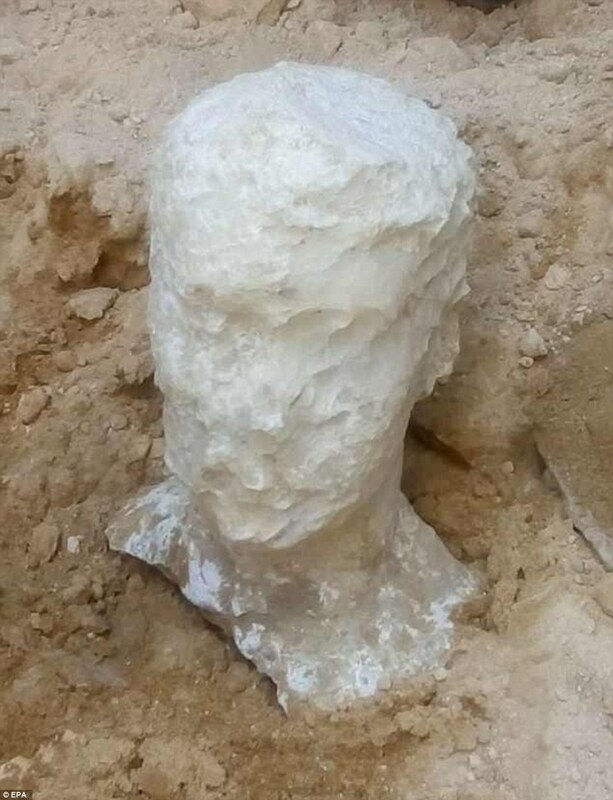 Questions as to the identity of the person inside arose due to the worn bust and the absence of any written inscriptions. Some said it belonged to a rich or noble man who lived between 323BC and 30BC. This was the time Rome seized Egypt and after the death of Cleopatra. The tomb was said to be 'too small' for a king like Alexander as bigger ones have been found to contain Roman nobles. Elsewhere in Egypt, archaeologists have also discovered an ancient pottery manufacturing workshop dating to more than 4,000 years ago. The Antiquities Ministry says the workshop is situated close to the Nile River in Aswan province in southern Egypt. It says the workshop, the oldest pottery workshop in the Old Kingdom, belongs to the 4th Dynasty, spanning 2,613 to 2,494BC. 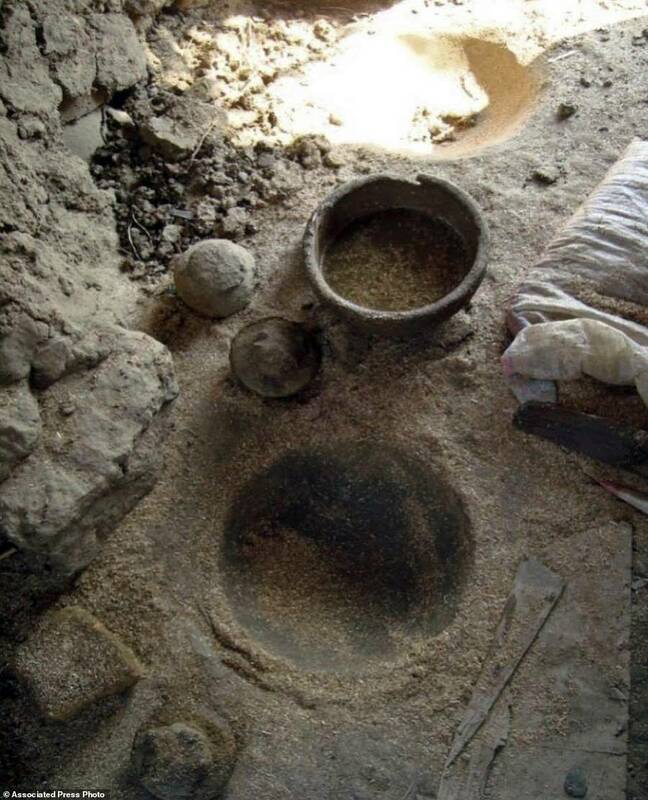 Mostafa Waziri added that the discovery was 'rare' and reveals more about the development of pottery manufacturing and the daily lives of ancient Egyptians during that time in history. The find follows another recent discovery in Egypt, in which archaeologists uncovered an ancient mummification workshop dating back more than 2,500 years. Specialist stumbled across the find near Egypt's famed pyramids at an ancient necropolis south of Cairo. 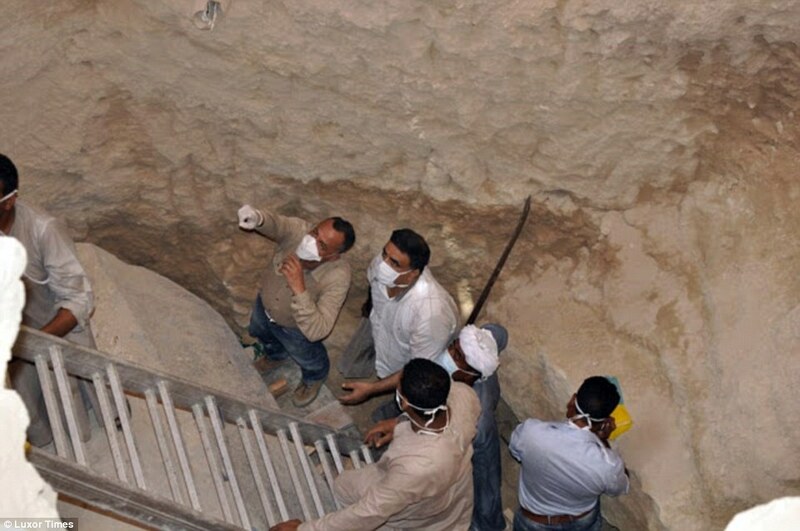 The discovery included a mummification workshop and a shaft, which was used as a communal burial place, located at the Saqqara necropolis of Memphis - the first capital of ancient Egypt. Memphis, a UNESCO World Heritage Site, and its vast necropolis are home to a wide range of temples and tombs as well as the three renowned Giza pyramids. The site, which lies south of the Unas pyramid, was last excavated more than 100 years ago, in 1900. No one is describing or speculating about the three gold plates -- and they don't appear in this article, although they have been photographed. One has a big snake on it; the others are less easily identified. Was that part of burial rites of the time? A gold plate for each deceased nobleman or noblewoman?